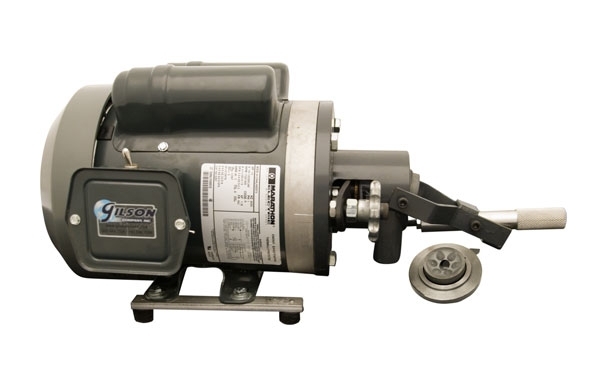 Mini-Pulverizer, Grinds Samples from No.40 to No.140 - Gilson Co.
LC-7 Mini-Pulverizer reduces 1—20g samples of 1/8in (3.2mm) material to minus No. 140 (106µm). The unit is supplied with 1.625in (41mm) diameter high density alumina ceramic grinding plates. A switch reverses direction of plate rotation for extended plate life of up to 3,000 samples. Grind is adjustable to produce sample sizes from No. 40—No. 140 (425—106µm). Nearly all product is recoverable by brushing. The LC-7 has cam-action closure with sealed bearings and is driven by a 1/3hp capacitor-start motor mounted on rubber feet. It operates at 115V/60Hz. The LCA-56 Tungsten Carbide Plate Set is available separately for use with extra-hard materials. LC-7F is identical, but operates at 230V/50Hz.